$4.99 flat rate shipping! Free on orders over $59.99. Offering more than 500 items! Dips, cheeseballs, seasonings and more! 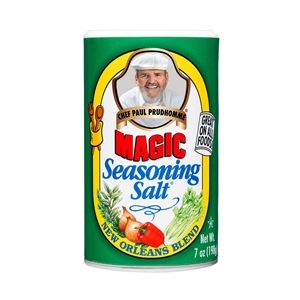 Magic Seasoning Salt® is an all-purpose blend that is great on any food! New Orleans blend of unique seasoning is perfect for sprinkling on fries, salads, eggs or pasta; for shaking extra flavor on vegetables, chicken, seafood, steaks, chops or roasts. Substitute for normal use of salt, pepper and other herbs & spices called for in a recipe. Use at the table in place of salt or pepper. Contains no MSG or preservatives, and is Kosher approved. Ingredient: Salt, spices, onion, garlic, mustard, tri-calcium phosphate (anti-caking agent).